Suitable for the very toughest of industrial applications. The Atlas AM bucket is anti-static, fire resistant and almost indestructible even in industrial applications, such as aggregates. Bolt holes to customer specification. Steel or plastic elevator buckets? What is a HIGH EFFICIENCY elevator bucket? Why use Low Profile elevator buckets? Low profile elevator buckets are created to achieve the closest vertical spacing possible on the elevator belt, thereby optimizing the system for the greatest potential capacity. Some styles of elevator bucket require modification and others are low profile by standard design. 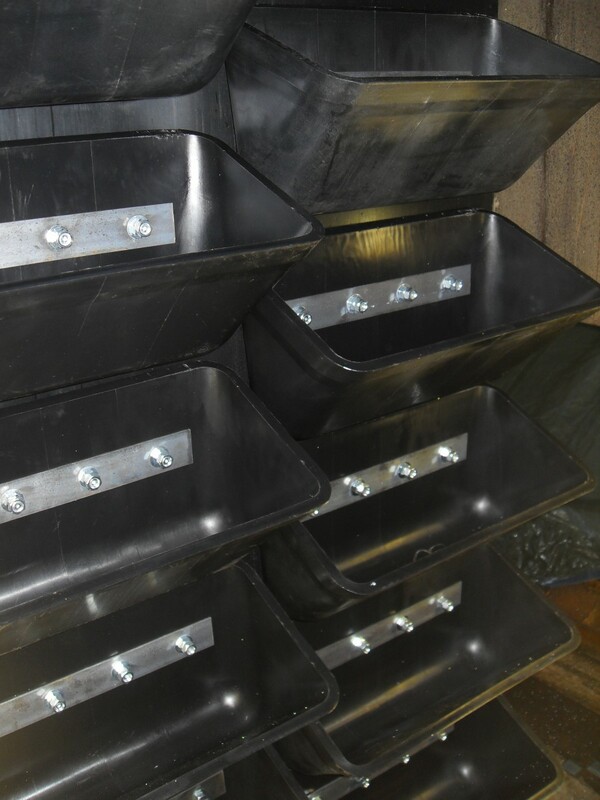 Wet or sluggish inputs do not generally load and discharge well in low profile buckets. Due to the extra capacity that is generated and the weight of the additional buckets and material, belt PIW rating, pulley shaft diameters and motor HP may have to be upgraded. Check with 4B engineering department about the best way to get the most capacity out of your elevator leg. Why add vent holes to the bottom of an elevator bucket? When elevating fluffy or powdery materials, vent holes in the bottom of the elevator bucket allow it to fill and discharge more efficiently. As material enters the bucket, it encounters a pillow of air resting in the bottom. Vent holes provide an escape path for this pillow of air, so that the entering material does not bounce out of the bucket and back down the elevator leg casing. Upon discharge, the vent holes allow air to re-enter the bucket at the material exits, releasing any vacuum that might hold it the bucket too long, creating down legging. Are CC style elevator buckets interchangeable with Starco elevator buckets? Starco elevator buckets have a special shallow geometry and are intended to be placed extremely close together on the elevator belt. Therefore, you should check with the 4B engineering department before replacing Starco elevator buckets with any other brand or design. How long of an elevator bolt do I need? What is a "digger" bucket? Some materials can form a hardened crust along the side wall of the elevator boot, and powders sitting over time can become rock hard. Both of these issues can cause premature elevator bucket wear. Digger buckets are designed to have slightly more width and projection than standard buckets, thereby "digging" through or breaking apart the hardened material, helping to prevent added wear to the standard buckets. 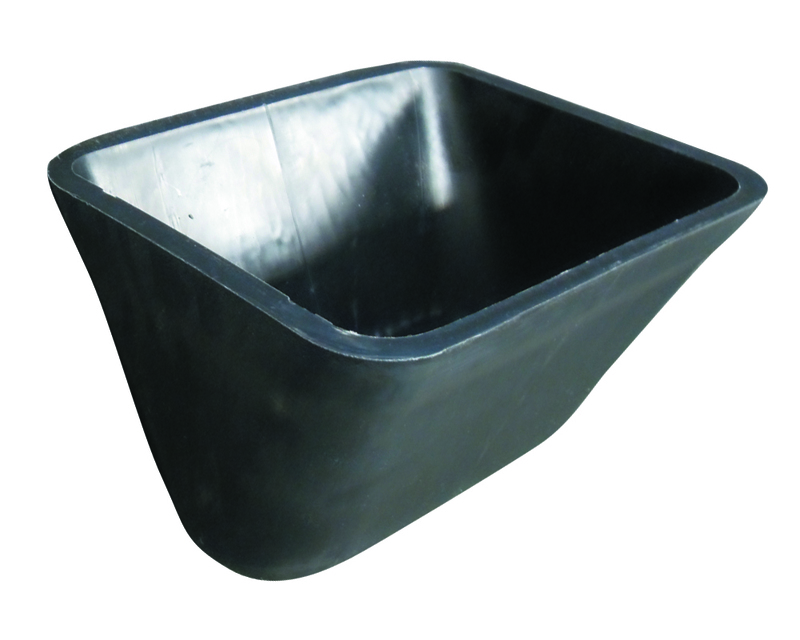 Digger buckets are traditionally made from steel, however nylon buckets may also be used depending on the application. How many digger buckets do I need? For most applications, use one digger bucket for every nine standard buckets. Can I use buckets on an overlap splice? An overlap splice doubles the thickness of the belt, so a bucket's projection will increase on the overlap. Usually this will not cause a problem, but if it does, you can use buckets with one inch less projection or cut the tip of each bucket by half an inch on the spliced area. When using an overlap splice, how much extra belt should I use for the splice? The length of the splice should be three times the width of the belt. How often should I replace head pulley lagging? Lagging should be replaced every time the elevator belt is replaced. 4B has a wide range of elevator belting to suit all applications. Belt types include anti-static, abrasion-resistant, high temperature, oil resistant, and flame retardant and steel web belting for the toughest environments. Belts are supplied slit, cut to length and punched to your requirements. View our NEW Elevator Belting Catalogue here.